I found a fantastic Irish sweater at the thrift shop that was nearly identical to the one I bought my husband 20 years ago. His had seen tons of wear (mostly on me!) so I exchanged the “new” one for the old. I thought I would felt the sweater and make a tote. After one round of felting, the sweater had shrunk, but was still in need of additional felting. Set aside in the laundry room, my son grabbed it and tried it on. The purse can wait. 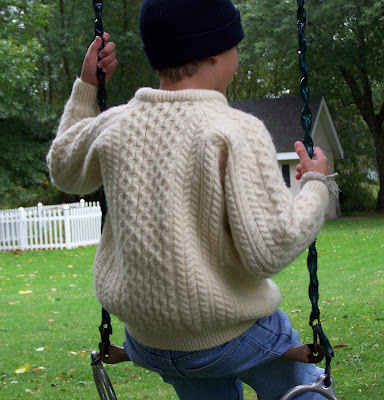 I am going to enjoy a season of seeing my son in this sweater. Oh man! That sweater is great! There is something about honeycomb that makes me so happy! Congrats on having a son with impeccable taste! That is great, hope you both enjoy it all season!